If you're planning a trip to Lanzarote and you want to go out and explore (which you definitely should do), then read our list of the best things to do on the island. Puerto del Carmen is the largest and most popular resort in Lanzarote. It's a great place for nightlife, as there are plenty of bars, restaurants and clubs that stay open until the early morning hours. Puerto del Carmen also has several great beaches, shops and activities for kids, so it's good for a family holiday also, especially the Matagorda area. The town is situated close to the airport, so it's extremely easy to get here, by bus, taxi or car. Since it's situated very centrally on the island, it's easy to make daily excursions on your own or with tour companies. One of the rising resorts in Lanzarote, great for families with young kids, as there are many activities around. The largest waterpark on the island is right in Costa Teguise and there are also many hotels with kids clubs, so that mom and dad can also have a proper holiday. Playa de las Cucharas is known as one of the best beaches in Lanzarote, although a bit windier compared with the beaches in other resorts. 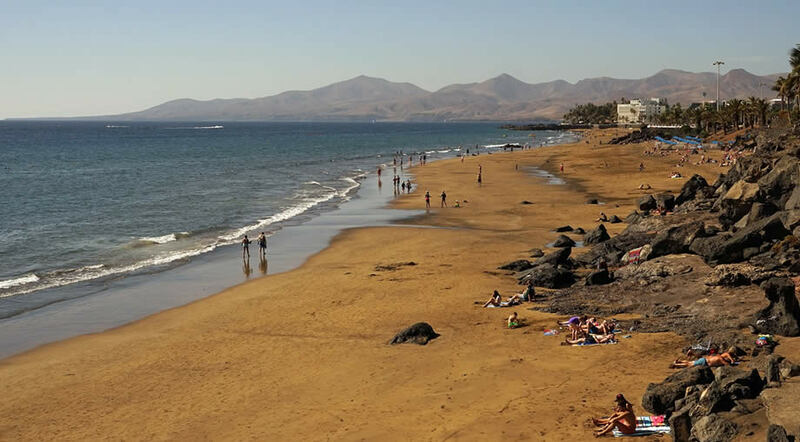 Situated in the very south of Lanzarote, Playa Blanca is a bit more quiet compared to Puerto del Carmen, but it's got great beaches and many attractions nearby. Playa Blanca also has a large marina from where you can take a lot of boat trips, including the ferry to Fuerteventura, if you're curious to spend a day in Corralejo. Each year, between the months of February and March, Lanzarote and the rest of the Canary Islands celebrate Carnival season. 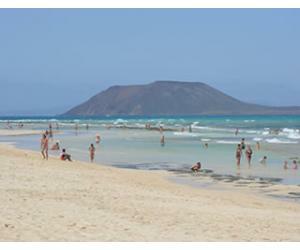 There's a party everywhere from Puerto del Carmen, Playa Blanca, Costa Teguise, Arrecife and even La Graciosa. If you're visiting at that time, do read more about the carnival in Lanzarote. Haria is a village situated in the valley known as the Valley of 1000 palms. This is actually the greenest part of Lanzarote, compared to the arid aspect the rest of the island has. You can stop for a short walk in Haria or maybe come on Saturday to visit the local market. Here's a list of things to do in Haria. Teguise was the capital of Lanzarote before Arrecife, so it's a small town full of historic buildings and significance. Teguise is a sleepy town during the weekdays and only comes alive on Sunday, when it's a big market day. If you want to explore more around the town, you can come during the other days and walk around to find out more about the history of Lanzarote. Read more about things to do in Teguise. The market in Teguise takes place every Sunday and it gets visitors from all over the island. There are hundreds of stalls, with handmade objects, clothes, food and even the usual fake bags and watches. There's something for everyone, just take care of your purse and haggle the price before you buy something. Teguise market is the largest market in Lanzarote and probably the largest in the Canary Islands. Ranchos Texas is the only animal park in Lanzarote and it's a great attraction for both kids and adults. 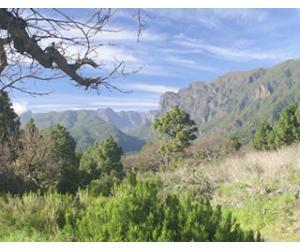 The park is situated very close to Puerto del Carmen and it's easy to get to by taxi or shuttle bus. You can spend an entire day looking at the animals and the shows and in the evenings they have a western night, where you can party like you are in Texas. The largest waterpark on the island is Aquapark in Costa Teguise, but there's also a smaller park called Aqualava in Playa Blanca. Not as big and impressive as Siam Park in Tenerife, but a good day of fun nonetheless, especially for the children. Located inside the Fortress Santa Barbara, the Pirate Museum can prove to be an interesting experience for adults and children as well. Open daily from 10:00 to 16:00. The Pirate Museum is located next to the Villa de Teguise and boasts spectacular views of the ocean and the island. Lanzarote is a great place to visit with the family and you should check out our list of things to do with kids in Lanzarote in order to plan some fun days for the little ones. If you'd have to choose just one place to visit in Lanzarote (but I personally don't know why you'd do that), it should be Timanfaya National Park and the bus trip around the volcanoes, to see the crater and learn more information about the volcanic of Lanzarote. Also, even if you don't have lunch at the restaurant located at the car park, you should go inside to see their barbecue where the chicken is cooked using the heat coming from the volcano. The green lagoon or the Green Lake appears in many photos when you look for info about Lanzarote and it's really a place you should see with your own eyes. The color looks different depending on the moment of the day and the light outside, but no matter when you, it's an interesting sight seeing the lake and the ocean so close together. Los Hervideros is usually paired as a visit with El Golfo and it's one of the best places where you can see the force of the ocean around the island of Lanzarote. 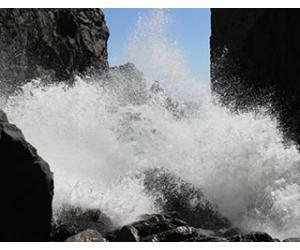 Going there when it's high tide or a more stormy day will totally increase the effect this place has on you. 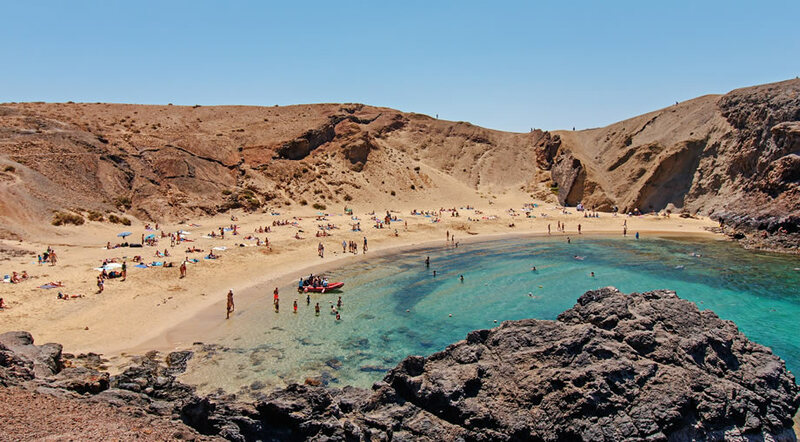 Situated inside a protected area, Papagayo beach is probably the most famous beach in Lanzarote and the one that you see on all the postcards. Go there to see the most beautiful turquoise waters but remember to take something to drink and eat with you, as there's no shops inside this natural park. 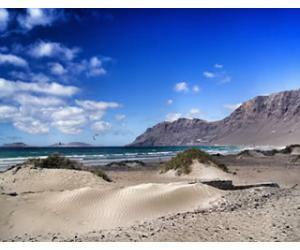 Famara beach is any surfer's dream and the place to come if you want to start surfing. Also, come visit to see the most amazing sunsets in Lanzarote and to enjoy a meal with fresh fish at one of the small local restaurants. Mirador del Rio offers the most breathtaking views in Lanzarote, overlooking over the island of La Graciosa. Take care to go up there on a sunny day, otherwise you won't see much. An entire garden, filled with different types of cacti, offering also great views of the ocean. It's a nice activity for an hour or two, espcially on a more cloudy day when you don't feel like being on the beach. 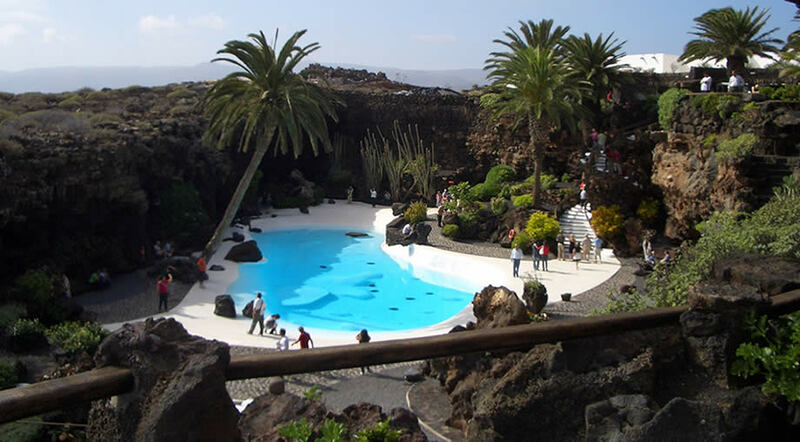 You have to visit Jameos del Agua to understand more about Cesar Manrique's vision for Lanzarote. With it's lake filled with albino crabs and its unique concert hall, Jameos del Agua is one of the best places to visit in Lanzarote. Arrecife is the capital of Lanzarote and it's located very close to the airport and it's easy to get there either by car or by bus. Although it's not the most exciting thing to see in Lanzarote, it can give you an idea in regards to local life beyond the tourist resorts. And they do have some pretty place like Charco San Gines and or Playa del Reducto. 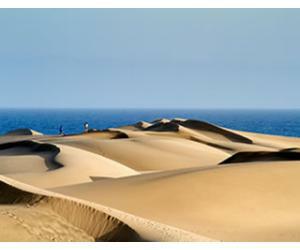 You can read further about the best things to do in Arrecife if you do decide to visit. After seeing La Gracios from Mirador del Rio you can't not want to see it with your own eyes from up close. The island has very few residents and most of them live there only during the summer months. There are no asphalt roads and you rent a bike if you want to explore the island and enjoy its beauty. Playa de la Francesa and Playa de las Conchas are the best beaches on La Graciosa, just remember to take your sun screen as there's no place to hide from the sun. 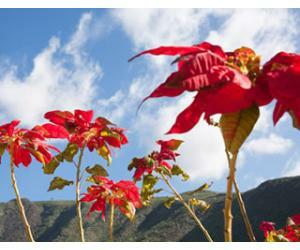 La Geria is the valley where the wine region of Lanzarote is located and a visit here will give you the opportunity to sample various types of wines produced on the island. Being the driver while on a wine tour may be a pretty bad experience for the one behind the wheel, but bus tours are available to book in the resorts, so everyone will be able to have a taste. If you've done it all and think there's nothing more to discover on the island...think again! 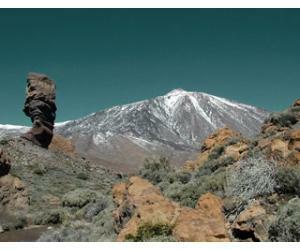 Here's a list of secret places in Lanzarote to add to your list of places to see. If you want to shop while on holiday in Lanzarote, a good idea is to visit the local markets. 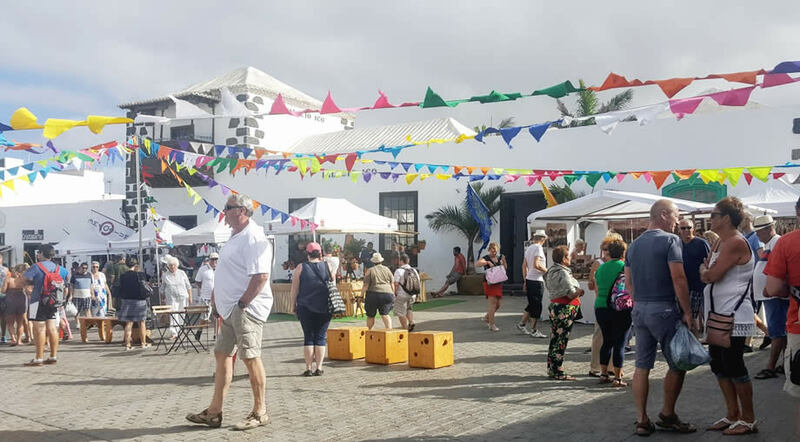 Every town and resort has at least one market day and you can read all about markets in Lanzarote if you want to know more. You'll find everything from authentic craft products, to souvenirs and knock-offs like sunglasses and clothing. Teguise has the largest market on the island, but the one in Playa Blanca is in a nice location, in the marina, and some of the stalls move from one market to another, so you can find similar products between all markets. If you've already visited Timanfaya National Park with the bus tour and you'd like to explore even further, you can go on one of the walking tours organized by the authority that has the park into administration. There are several guided walks available and you need to book online in advance. This one of the most amazing things to do on the list of Lanzarote attractions and it's a unique museum among the Canary Islands and unique in Europe as well. Atlantico Museum is the creation of Jason deCaires Taylor and it features around 400 underwater sculptures. Head over to Marina Rubicon in Playa Blanca if you want to book a tour that will take you diving to the location where the sculptures are located.